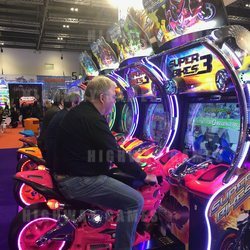 BANDAI NAMCO Amusement Europe (BNAE) enjoyed a particularly positive EAG 2019 show. "We had a very busy stand throughout the show and our visitors were of a high quality. This year we took the decision to show not only a large number of new products but also some of the 'ever-greens' which are still in our catalogue and performing very well. This seemed to really pay off for us," says BNAE Commercial & Sales Director James Anderson. BNAE showed the two-player version of Halo: Fireteam Raven, compact 4-player versions of Tomb Raider and Rabbids Hollywood, and the extremely popular Super Bikes 3. Other products on display at their stand included Marvel Adventure Lab, a collection of cranes from The Really Big Crane Company, Triotech's 10th Anniversary edition Typhoon simulator, Jumbo Jumpin, Blox Breaker and Batman vs Joker Laughing Madness Slimline Air Hockey. This wide range of interesting products drew many visitors to the stand. BANDAI NAMCO had a full range of gift and plush to compliment the top-rated and high-earning Halo: Fireteam Raven. "We had a lot of interest in our Shazam and Minecraft ranges head of the new movies," said John Beresford, who is new to the prize division and joined Darrell Simmonds at the show. "We also took a lot of orders for electrical products and confectionary and our new selection of inflatable balls for cranes, with a redemption twist." Steve Short from BANDAI NAMCO, Management Solutions showed the new TOOLKIT features from Embed at this year's EAG. "The interest in cashless solutions is growing," he said. "We had a lot of interesting conversations about the TOOLKIT central games management feature, which will make operators' lives much easier. People particularly liked The Assistant mobile App, which would allow them to manage TOOLKIT remotely and on the go."